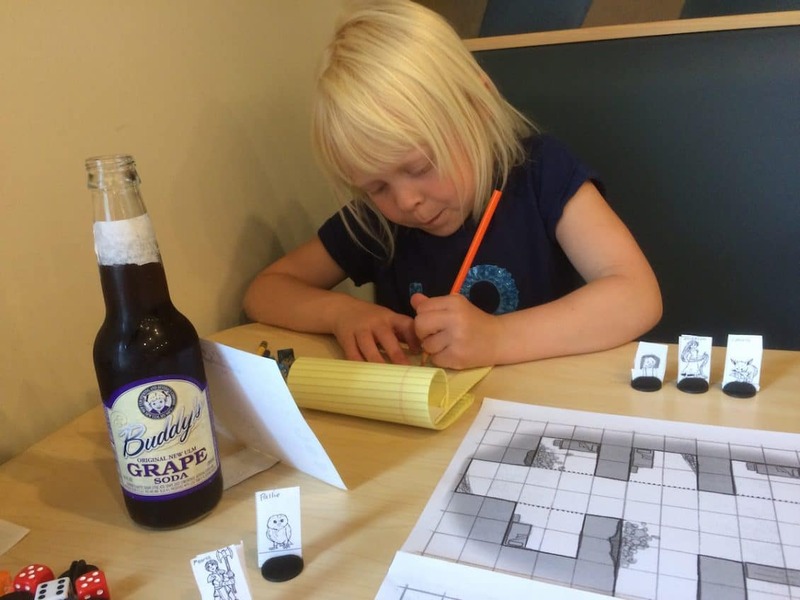 Hero Kids is a fantasy themed pencil and paper role-playing game for kids age 4-10, written by Justin Halliday, and I aim to review it. I’m not exactly sure if it’s every dad’s dream that their children will turn out to be as nerdy as they are – since I’d like my girls to survive junior high, after all – but I do know that I love finding meaningful hobbies to share with my girls. Hero Kids is one of those hobbies and something I love playing with my six-year-old daughter. 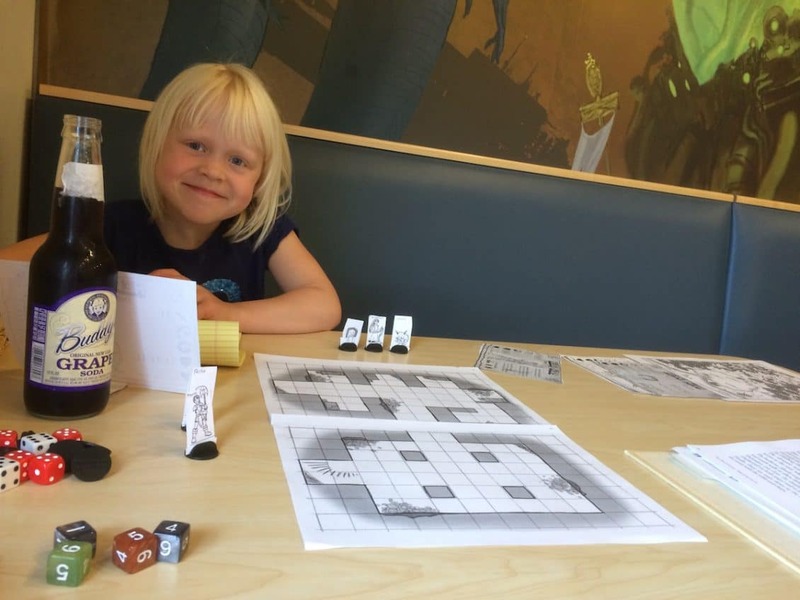 A Review of Hero Kids: What is the setting for Hero Kids? Hero Kids is set in a town called Rivenshore. As luck would have it, Rivenshore is surrounded on all sides by danger. So when the adults are busy, it is up to the kids to go adventuring, keep the town safe, and make sure the pets are accounted for. Like any good fantasy setting, Hero Kids starts in the local tavern with an introductory adventure called Basement o’ Rats, which asks our wee heroes to venture into the tavern basement to save their buddy Roger (of course he has the name Roger) from rats the size of those giant stuffed teddy bears they sell at Costco. The adventure was a smash hit and my daughter immediately asked if we could run it again. A Review of Hero Kids: How does it play? All you need to play Hero Kids is contained in one PDF that weighs in at about 30 pages. Kids can easily understand the basics of the game. Plus, the simple system is based upon 6-sided dice, a component that even non-roleplayers typically have on hand, even if it means scavenging through their Yahtzee game. The game includes 10 pre-generated heroes, in both boy and girl characters. Character attributes are associated with four basic primary attributes (melee, ranged, magic, defense), and each pre-generated character is given well-balanced and kid-friendly specialty maneuvers. My 6-year-old daughter instantly took to the Rapunzel-like character with a long hair whip-attack, plus used a blank character sheet to create a character based on herself. The character sheets are simple, easy to read, and includes identical paper-cutout figure standees. Included are both full color maps and identical black and white versions if you want to save on printer ink. The maps are sparsely done in a way that captures a kid’s imagination well. The maps are also designed with a simple grid that doubles as the movement system for Hero Kids and allows players to shuffle their hero and bad guy standees about. Does Hero Kids provide adventures?!!? There are at least a half dozen pre-written adventures that can be download individually or purchased together in a bundle pack. One adventure has the residents of Rivenshore captured by pirates and thrown into the hold of their ship. Another has the kids rescue a wounded unicorn from a pack of marauding goblins. The full list of adventures is here. Hero Kids also offers a couple expansions, one of which is a pack of pets you can get. Trust me, get the pets. Your children will love you. The expansions are found here. Will kids love Hero Kids? Your kids will love Hero Kids. On the first day of Summer break it was a rainy day, so I loaded my backpack with Hero Kids and took my daughter to the local game shop, Fantasy Flight Game Center. I bought her her first grape soda and as we settled in, she spilled it, of course. But that’s all part of the experience and as we sopped it up, I gave a brief recap of our storyline thus far (quick, the unicorn still needed our help!) and let her make the choice of her characters’ next steps. Thankfully, Hero Kids keeps the plots simple and I’ve yet to find one that doesn’t engage little imaginations. Before I knew it, we had knocked out several goblins and explored new lands with our fox and owl companions. Unfortunately, my daughter doesn’t have a concept of caution, so she ran headlong into a fight she couldn’t win, because she expected daddy to fudge the die rolls on her behalf. 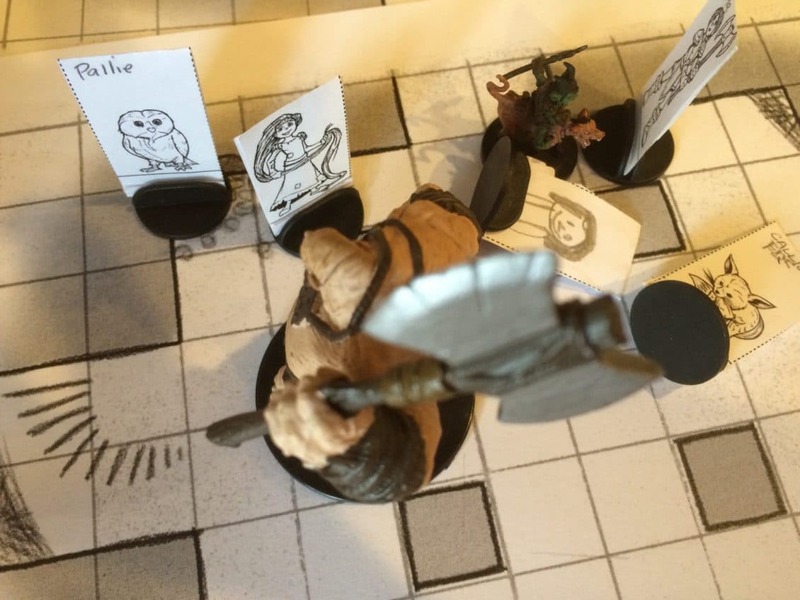 I wanted the tension and consequences to feel real(ish), but I did ultimately cheat on her behalf and said that her owl had flown off at the last possible second to find help, allowing the party to be rescued to fight another day. Of course, I add in props when I can and substituted my Pathfinder goblin miniatures for the paper standees at one point, which my daughter thought was fantastic. Then, there was the time I added in an ogre, which was a baddie much bigger than she has faced before and caused her to go wide-eyed. I’ll also sometimes use real chocolate chips as the “treasure” she discovers at the end of an adventure. Hero Kids is great fun. She loves it and I love the time with her. You can check out Hero Kids at their official site.